AUTHOR INFORMATION: Allen Houston grew up in Bixby, Oklahoma. He attended the University of Oklahoma, where he earned a degree in English Literature. After graduation, he lived in Indonesia and Japan for a while. Upon returning to the states, he worked as a reporter/editor at the Dallas Morning News and The New York Post. He currently works as the City Editor of Metro New York. Allen resides in Brooklyn with his family and a menagerie of animals. This is his debut. OFFICIAL BLURB: Vain Lily Blackwood and her shy brother Silas wonder if their family will ever settle in one place long enough to lead a normal life. When a mysterious stranger in a wolf-hide cloak arrives claiming to be their uncle, they discover their parents have been hiding a secret that turns their world upside down. Lily must take over as protector of the house and three haunted gardens that hold mythical beasts, fairy-tale nightmares and far worse. If she doesn't, the evil trapped there will be unleashed and bring on a new dark age. While she deals with malevolent ghosts, murderous dolls and killer insects inside the house, Silas is put to work in the gardens, a hothouse of terror, where one wrong step means death. FORMAT/INFO: Nightfall Gardens is 241 pages long divided over fourteen numbered and titled chapters. Narration is in the third-person via Lily Blackwood, and Silas Blackwood. There is also an acknowledgements page. Nightfall Gardens is the first volume of the Nightfall Gardens trilogy and its sequel The Shadow Gardens was recently released. May 10, 2013 marked the paperback and e-book publication of Nightfall Gardens and it was self-published by the author. The cover illustration is provided by Tony Roberts. ANALYSIS: Often it is said that never judge a book by its cover but over here that along with the blurb, was exactly what drew me to Nightfall Gardens. When the author approached us for a review, I read an excerpt and ended up asking for a review copy simply because of the intriguing narrative. Now usually I don’t review much in the YA/MG fantasy genre but with this book, I was glad to that I got to read it. The story begins in the late seventeenth or early eighteen century (it’s never clarified) in New Amsterdam and opens up with Lily and Silas Blackwood who along with their mother and father are part of an acting troupe that travels from place to place, never setting any roots. The children are perplexed and sorely vexed at this aspect of their childhood. Soon a stranger who says he’s her uncle accosts Lily after their most recent play. Lily however is taken aback at his coarse manner and dressing however once Silas and her parents get involved, the family truth come leaking out. Lily and Silas are the last pair of siblings for the Blackwood family and must return to their ancestral Blackwood mansion as time is running out for Lily. Thoroughly bemused at their predicament, the children soon are forced to go back and then learn more about their odd family history, odder relatives and other occupants of the mansion and lastly the deadly gardens (White, Shadow & the Labyrinth) that share the grounds around the mansion. Lily will have to take up the mantle that is bestowed upon her by birth and Silas will have to endure his station in the gardens for if they don’t learn everything then all is doomed. This story is a nice middle grade fantasy, which deals with a family curse, Greek mythology and two siblings who get sucked into all of it. The story primarily focuses on Lily and Silas Blackwood who will have to survive Nightfall Gardens and all that it entails. I liked how the author set up the story and immediately set things into motion with the appearance of their uncle Jonquil. With a nice terrific addition of certain Greek mythology stories (and a tiny nod to Indian mythology as well), the author then paints a world that is crumbling and all rests on Blackwoods. Of course with this being a middle grade fantasy book, there are certain levels to be maintained in regards to characters, plot and the amount of creepiness laced into the story. The author does very well in making this story a scary one and his fertile imagination makes the Blackwood mansion as well as the gardens around it a very terrifying place for its inhabitants. I loved the minutiae about the gardens (all three of them) and especially of the Blackwood family mansion, which is like a scary & twisted version of the Addams Family mansion. 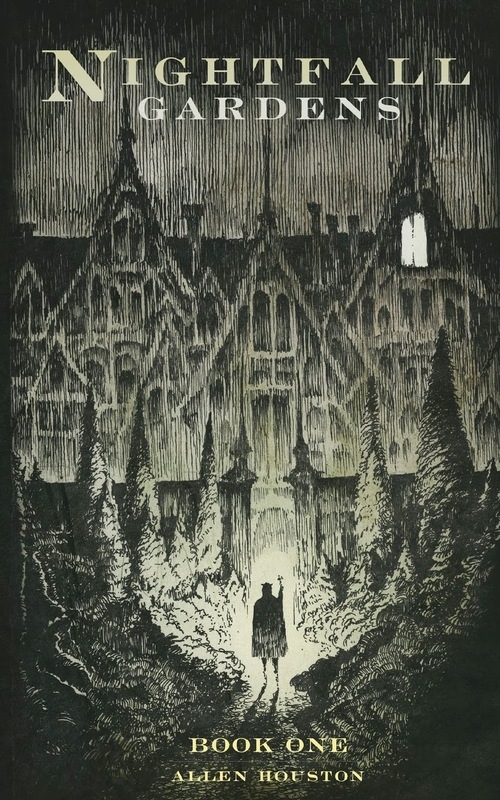 The storyline progresses smoothly as various characters and mysteries are unveiled and the reader is sucked deeper into the world of the Nightfall gardens. Both Lily and Silas take different routes as per their position in the family household and possibly are best suited to solve the mysteries that are prevalent in this world. A thoroughly creepy and well-nuanced plot that ends on a solid note, Nightfall Gardens is a great MG/YA fantasy debut. For those readers who loved R.L. Stine when they were kids, might find this book very much to their liking. This was a different read for me simply because I’m not usually a reader of this genre but Allen Houston’s storytelling style and imagination have won me over and now I can’t wait to read the sequel The Shadow Gardens. CONCLUSION: A creepy debut that manages to mix Addams family with Lemony Snicketts and provides a terrific read at the same time, Allen Houston marks himself out with Nightfall Gardens and will be sure to gain new fans as word spreads about this trilogy.